Posted on Sep 30, 10:31 PM in Well Being and Workplace Health. No comments. Are you struggling to make it through your working day? In a “high energy” profession and experiencing more “downs” than “ups”? Finding it difficult to find the energy to work or to “get about your day” doing your usual tasks and chores? Your first port of call is to examine your work load and stress levels and to make sure you are getting enough exercise and rest. People who sleep between 6.5 hr. and 7.5 hr. a night, live the longest, are happier and are the most productive.Making sure you don’t have any underlying health problems that are contributing to fatigue at work is important too. Maintaining a healthy weight can help your energy and productivity at work. In some large factory studies, obesity has been shown to lead to fatigue and loss of dexterity at work. Rapid weight shifts and “yo-yo” dieting can also be a problem. If you are struggling with energy levels at work and are over/underweight, achieving the healthy weight for you should be your ultimate aim. Ditch the fad diets and quick fixes and look towards establishing a regular eating pattern. There have been many studies showing the effect of having breakfast on cognitive performance. In 2010, a summary of studies looking at breakfast and cognitive performance in children at school concluded that omitting breakfast interferes with cognition and learning. Similar studies have been done with adults. In one recent study in which over 800 nurses took part, researchers showed that those who had breakfast regularly had lower stress, fewer cognitive failures, fewer injuries and fewer accidents at work. So it’s vital not to skip breakfast. Breakfast replenishes your supply of glucose and other essential nutrients to keep your energy level up throughout the day. A healthy breakfast will increase energy, fight fatigue, increase endurance and strength, especially if you have a very active job during the day. In fact, don’t skip any meal – have regular meals and occasional snacks if needed. fruit salad, yoghurt, smoothies, oats and fruit, beans, avocado or peanut butter on wholegrain toast, muffin and egg, high fibre cereal or an omelette. The key to achieving a healthy lunch and keeping your energy levels from waning in the afternoon is getting the right balance. Inadequate protein at lunch can lead to low blood sugars, afternoon slumps and can result in appetite changes leading to hunger. This in turn can lead to afternoon snacking on the wrong things – sugary drinks and snacks. An ideal lunch is a balance of proteins and carbohydrates. A good example of an energy sustaining lunch would consist of any combination of fish, pasta, rice, quinoa, baked/sweet potato, fruit salad, vegetable, lean meat or lentil and vegetable soup. GI or Glycaemic Index is a ranking system of carbohydrates which describes the way they will affect blood glucose. Low GI foods tend to cause lower and more sustained rises in blood, keeping you feeling fuller and balancing and maintaining energy for longer. Your meals in the day should be low GI or at least contain low GI foods. Low GI foods you may want to include at lunch are: yoghurt, heavy mixed grain breads, sweet potato, beans and chickpeas, lentils, nuts, wholemeal pasta, noodles, sweetcorn, apples, pears and peaches. Reducing the pH of a meal also reduces the GI, so adding vinegar or lemon juice to salads can help to reduce the GI. Sugary drinks and snacks might seem like a good idea but they will only give you a short lasting burst of energy. And after that short burst, comes the slump. Choose energy sustaining, low GI snacks and healthier choices like fruit, yoghurt, nuts, air popped popcorn or hummus and vegetable sticks instead. Not drinking enough water is a common reason for people losing concentration and becoming tired at work. Keeping yourself hydrated can help you maintain your energy levels through the day. Women particularly can be prone to iron deficiency. Iron deficiency can be associated with decreased general health and well being and increased fatigue. Make sure you are getting enough lean red meat and iron containing foods through the day. The best source of iron is lean meat. Other sources include chickpeas, lentils, broccoli, cashews and almonds. Caffeine can be an effective quick fix but take care not to overindulge. High caffeine intakes can not only interfere with sleep patterns but can also minimise the effectiveness of your coffee break. There are some suggestions that foods containing antioxidants can help encourage blood flow and maintain energy. Foods which are high in omega 3 fatty acids may also have an effect on reactivity, attention and cognition. blueberries, apricots, spinach, salmon, almonds, walnuts, green tea, sunflower seeds and avocado. 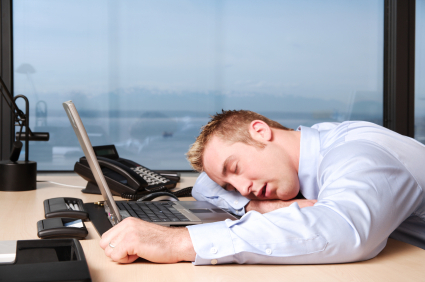 Try these tips and see if you find your energy levels are better at work. It’s important to take the time to plan your meals and snacks and to take the time to eat your lunch. Workers who eat at the desk don’t perform as well as those who eat away from their desks. Make time for lunch, have a walk or do some light exercise in the day and you may find it makes the world of difference.